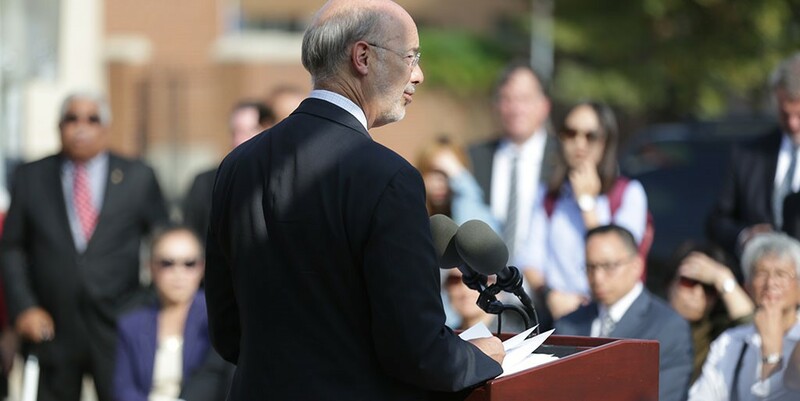 Philadelphia, PA – Governor Tom Wolf joined Representative Mike O’Brien today to announce a $1.3 million grant to help fund the construction of the new Philadelphia Chinatown Eastern Tower Community Center. This project will create and retain nearly 160 full-time permanent jobs, as well as 500 additional jobs during construction. The mixed-use tower, which will be located at the northwest corner of 10th and Vine streets, will consist of 21,000 square feet of office space, 8,700 square feet of retail space, 17,000 square feet of recreation and event space, and 150 high-rise residential units. The $1.3 million Redevelopment Assistance Capital Program (RACP) funds will go toward construction of the commercial and community center portion of the $76 million overall project. The project will create 500 construction jobs, 480 spin-off jobs during the construction period, 159 full-time created and retained jobs, and 148 additional indirect full-time jobs, according to PCDC. Construction is expected to begin before the end of 2016, with an estimated completion date in the fall of 2017.